1. Biggest WeWork yet is coming to Brickell. WeWork is still bullish on Miami’s growing base of entrepreneurs and gig workers. 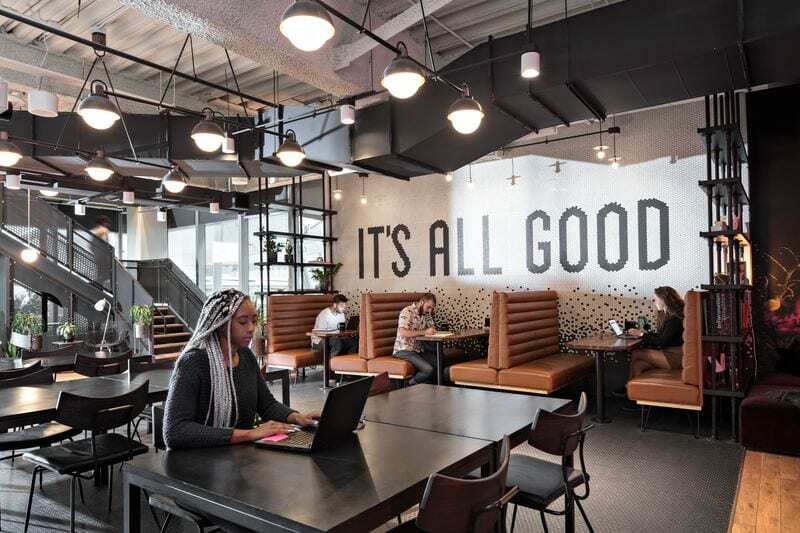 The co-working giant announced this week that it has signed its seventh lease in the South Florida market, WeWork 830 Brickell, a ground-up development that is slated to open in early 2021. The new WeWork community will occupy 10 floors across 146,000 square feet at 830 Brickell Plaza in Miami, and accommodate more than 2,400 desks for members. This location will be WeWork’s largest in Florida to date and the second largest in the Southeast. The new location will join five others that are already open, including centers in Brickell City Centre (pictured) and downtown Miami’s historic Security Building. Other existing WeWorks are in Miami Beach and Coral Gables. A sixth location was announced only a month ago and is scheduled later this year in Coral Gables. The Miami area already ranks No. 1 in the nation for co-working space in at least one ranking, and there seems to be no letup in announcements. Spaces recently announced it would be leasing 43,000 square feet at the five-story One CocoWalk office building under construction in Coconut Grove, its second Miami location. 2. MDC offers opportunity to pitch your way to eMerge. Pitching opportunities will be coming fast and furiously now, in the run-up to eMerge Americas conference on April 29-30. Here’s one for Miami Dade College students or community members who participated in Idea Center programs. The Idea Center at MDC in partnership with eMerge Americas will host Pitch Night, Wednesday, Feb. 13, at 5:30 p.m. This event is free and open to the public. Have Pitch, Will Travel? Eight startups from around the state will compete at the second annual Startup Pitch Competition at next month’s TiECON Florida conference in Tampa. The deadline to apply is Jan. 20. TiE recently established a chapter in Miami and has had an active chapter in Tampa for years. The top three startups will have the chance to pitch for funding at an upcoming TiE Angel Forum. In addition, their elevator pitch will be shared with the TiE Angels Alliance, which includes more than 3,000 charter members in TiE chapters worldwide. Startups can submit their applications here. The pitch season of course, is already underway. Eight South Florida companies were chosen to present at the Florida Venture Capital Conference at the end of the month. Two Miami startups, Logixboard and SunVessel, will pitch at Synapse in Tampa next week. More opportunities are on the way. Shameless plug: Need some help preparing? Next Friday, Jan. 25, Refresh Miami and UM’s The Launch Pad are teaming up with the Miami Angels, South Florida’s largest angel investor network, to host “The Pitch” workshop. Learn how to improve your pitch deck, your presentation and effectively raise capital from angel investors. Register here. 3. Startups in the news: Freebee cruises the growth lane. Freebee, that cute little (and, yes, free) shuttle service you summons with an app, is expanding thanks to partnerships with municipalities. Freebee already services Coral Gables, Key Biscayne, Miami Lakes and parts of Miami and is starting service in Pinecrest, according to the Miami Herald report. Now the cities can tap the transportation tax to expand the services. “Almost every municipality in Miami-Dade is talking to us, from Miami Gardens down to Homestead,” said Jason Spiegel, who co-founded Freebee in 2012. As one Twitter follower said, “Love this for our city!! Now Kendall, Homestead and Hialeah please.” Read the Miami Herald story here. 4. AT&T accepting applications process for ed-tech accelerator. Calling all ed-tech startups, both for profit and nonprofit, that are focused on preparing students for career success and narrowing the country’s growing skills gap, particularly in the STEM Fields. The application process opened today for AT&T’s $1 million AT&T Skills Building Challenge, marking the fifth anniversary of its ed-tech Aspire Accelerator. The top 8 applicants nationwide will receive $125,000 from AT&T as part of their participation in the 6-month Accelerator program. Applications may be submitted here until Feb. 1. Last year Miami ed-tech start-up Caribu was selected to participate in the 2018 AT&T Aspire Accelerator class. 5. We’re happy and we know it. I’m not a fan of these kinds of surveys, but Christine Johnson of the Beacon Council pointed out a fun one by job site kununu. It reviewed its database of more than 87,000 employee reviews in the 50 biggest U.S. metro areas and found that Miami had the highest scores for employee job satisfaction. Respondents said they found challenging work where they could work in independently and their management encouraged ideas from team members and supported career development. Los Angeles was No. 2; Raleigh, No. 3. The Big Apple came in at No. 50. The report said Miami and LA also got high marks for overall quality of life outside of work, like great local beaches and plenty of sunshine. Check. But I’d be remiss if I didn’t point out that Miami’s tech salaries trail the national average. Not good.